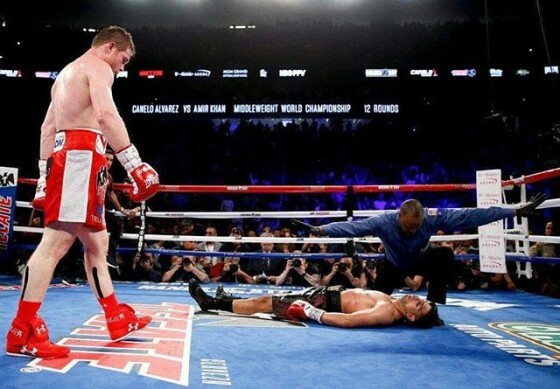 On Saturday night, May 7, WBC middleweight champion Saul “Canelo” Alvarez stopped a courageous Amir Khan in the sixth round of their HBO pay per view showdown from the T-Mobile Arena in Las Vegas, Nev.
Canelo (47-1-1, 33 KO’s) had a little trouble early on adapting to Khan’s style, as the British star and former junior welterweight titlist stuck to moving and boxing early on. Through four rounds several outlets had Khan ahead of Canelo, who was patiently biding his time. Canelo began touching Khan more and more in the fifth round. In the sixth a huge overhand right connected right on Khan’s chin and he went down hard. Referee Kenny Bayless wisely waved the fight off, granting Canelo with his first official defense of his title, despite the 155-pound catch weight. Following the match, Team Canelo motioned for lineal middleweight champion Gennady Golovkin to enter the ring, in an effort to address the intrigue that comes from a potential clash between the two stars. Stay tuned for more post-fight coverage.